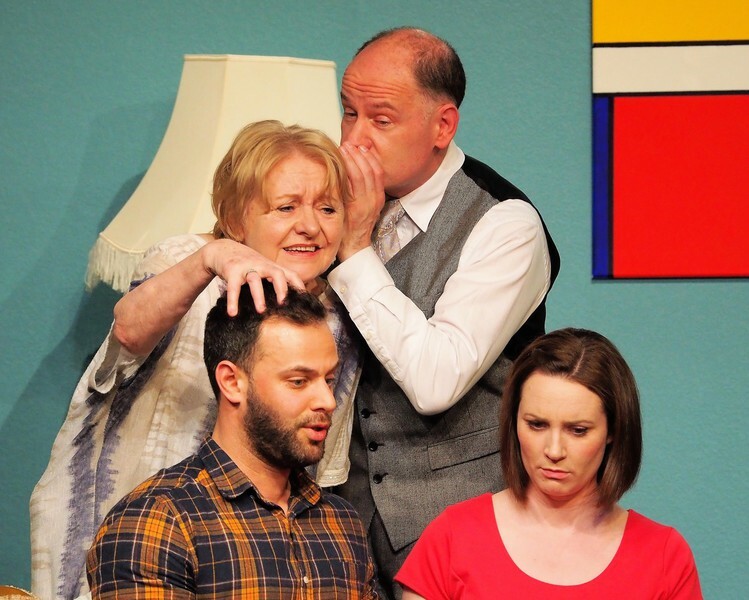 Founded in 1945, Adel Players is an amateur drama group with at present around 40 members. 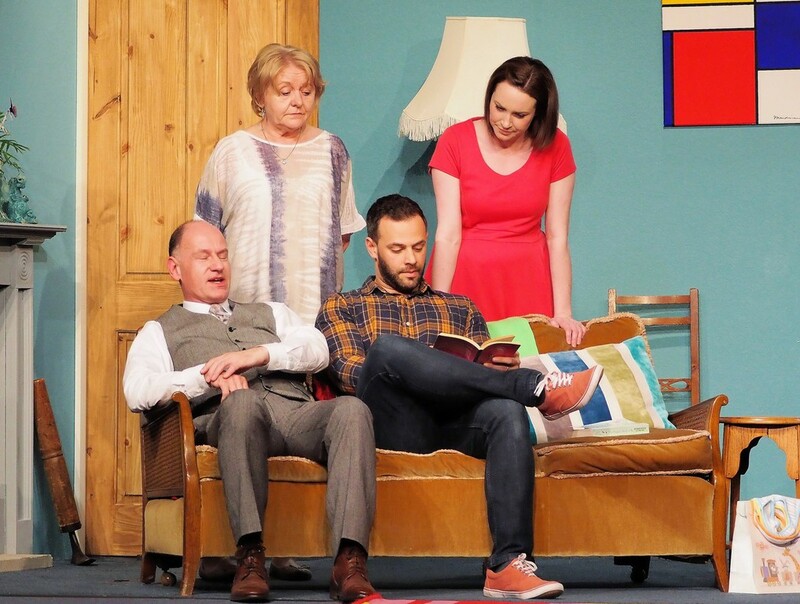 We put on three plays a year in our own theatre space at the Adel Memorial Hall in north Leeds as part of the Adel Sports and Social Club. Find out more at About Us. For our next production, please see below, or if not there just click here: Forthcoming Productions. We hope you enjoy this website. If you see something not working or have any other feedback, please feel free to leave a comment here. After last year's great success, Adel Players are once again proud to present our annual Murder Mystery entertainment. Penned by our resident thriller writer, Pat Riley, we will be performing at the Robert Craven Hall in Bramhope as well as at the Memorial Hall in Adel. See poster below for details, and do consider booking early (see here) as tickets tend to go fast for these events. The suspense is killing! SPIRIT LEVEL DRAWS THE CROWDS! Our latest production had its final performance on 13 April. We had an audience of just shy of 500 in total over the four nights and as always, we are very grateful to all our loyal patrons for their continued support. "Excellent, definitely worth going, haven’t enjoyed myself so much in months..." was typical of audience reactions and it was nice also to get the following feedback: Just wanted to congratulate Pat on a wonderful performance last night. Did not realise she was “starring” in it until we got the programme! We both loved the play too. 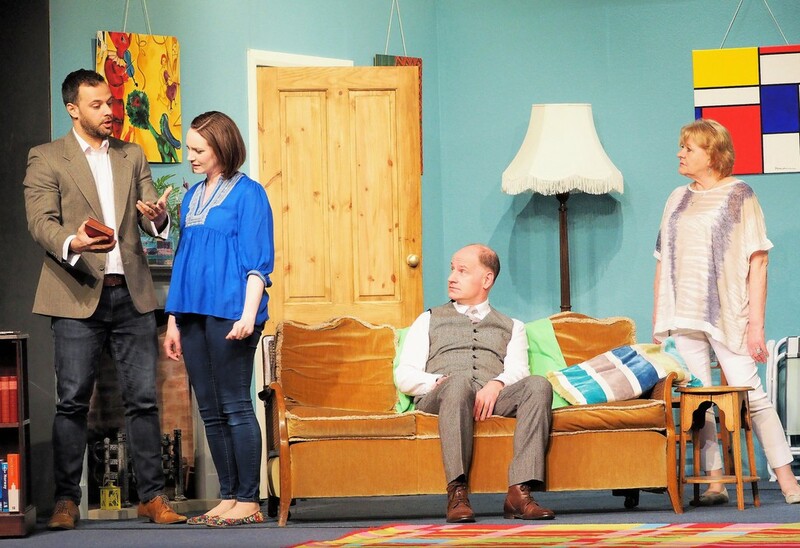 We needed a good laugh… it was a very funny play and of course superbly acted by all. Good to see some talented newcomers too". As usual pictures, reviews and other audience reactions will be posted here as we get them. Production photos for "Spirit Level"
Our thanks once again to Tony Zigmond for the equipment and expertise that contributed to this lovely record of the show. 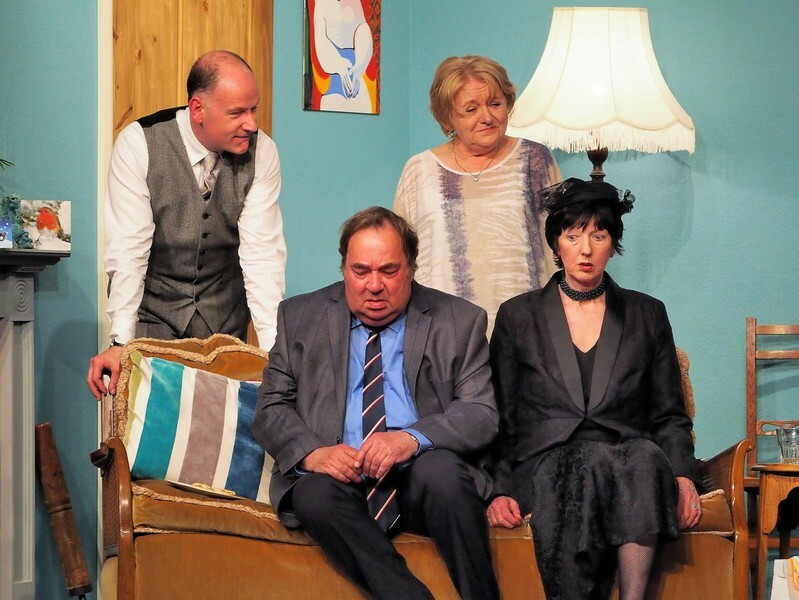 First produced in 2010, our third play of the season was a light comedy with a strong streak of fantasy and moments of classic farce. Jack and Susie Cameron drowned in a boating accident while on a holiday in the Italian Lakes. They now haunt their old cottage, staving off boredom by tormenting the local estate agent and the various tenants who rarely stay long. Then a young couple arrives and Jack and Susie decide that they really quite like them and start to get involved in their lives. 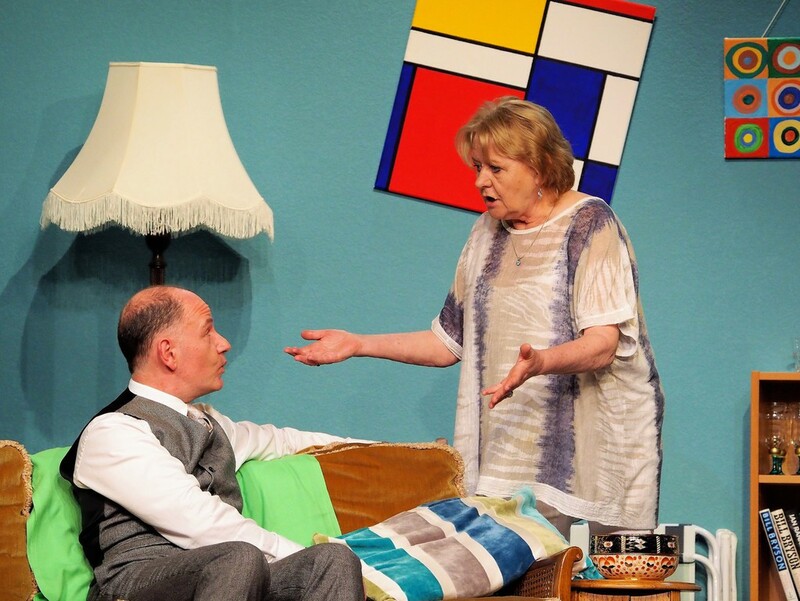 Director, Alan Foale, told us before the show: “Spirit Level is a light comedy about couples young and old and the strange ways in which human relationships develop. It is indeed a play to lift your spirits. I was enchanted when I first read the play and it was so fresh that it held my attention throughout, as well as making me laugh out loud! And it left me to reflect on human nature without ever feeling that someone was lecturing me”. 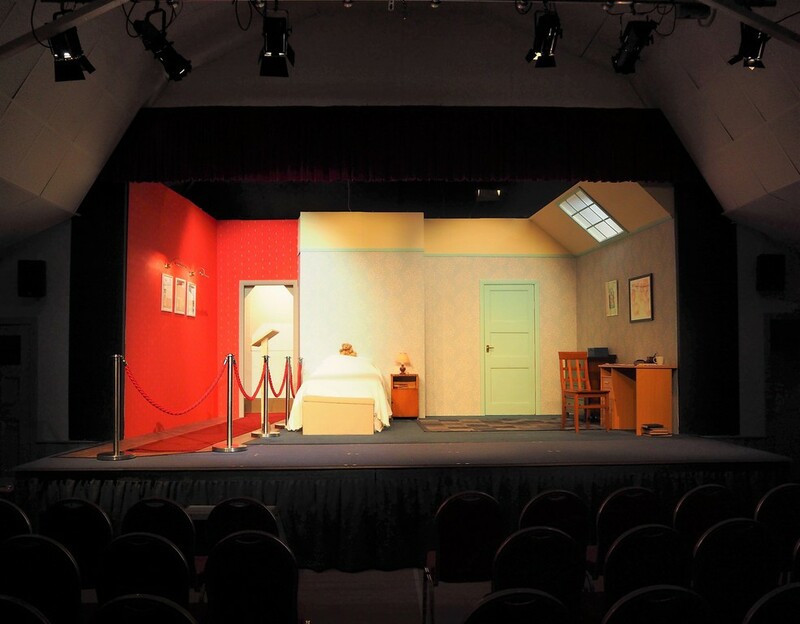 More than 430 audience members came to see our January play from the pen of Alan Ayckbourn. 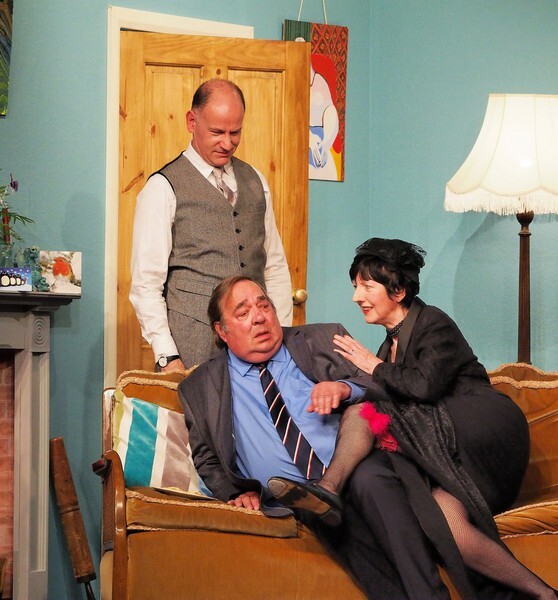 Not his usual comedic offering, this chilling and sometimes dark work kept our audiences fully engaged and proved to be a superb vehicle for the three actors, Mike Andrews, Robert Colbeck and Matthew Newby who carried the whole piece with great aplomb. 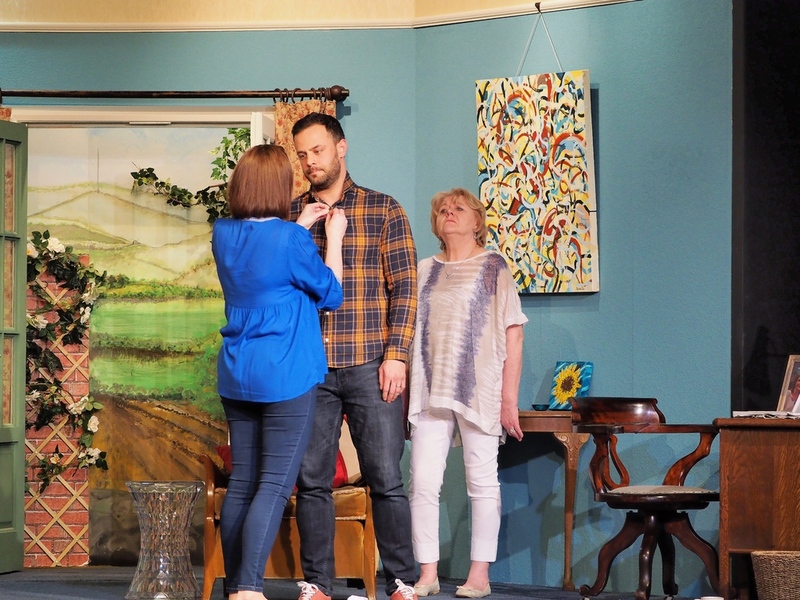 Many thanks to those who came to support us and of course to the many members of Adel Players backstage and front of house who contributed to getting it ready for performance. Production pictures are posted below and we will add reviews and audience reaction as they come in. First produced in Scarborough in 1994, Haunting Julia is essentially a ghost story. The play is set on the top floor of the Julia Lukin Centre, a bespoke combination of museum, shrine and music school. Here the attic bedroom has been recreated in which Julia, a musical prodigy, lived as a student and died a tragic, untimely death at the age of nineteen. Along one side is the viewing area, on the bed her favourite teddy bear. Three men gather in this room, each with his own connection to Julia, and, as they discuss the events leading up to the apparent suicide twelve years before, a series of eerie phenomena begins to take over the building. Has Julia gone for good or is she preparing one final, terrifying appearance? A real spine-tingler for a dark January night! Our thanks to Tony Zigmond for the equipment and expertise that helped in producing the following record of the production. This was strangely powerful theatre, not entirely comfortable watching from my point of view. It relied almost entirely on the spoken word – what masterful performances from three experienced and accomplished actors Mike Andrews, Robert Colbeck and Matthew Newby! 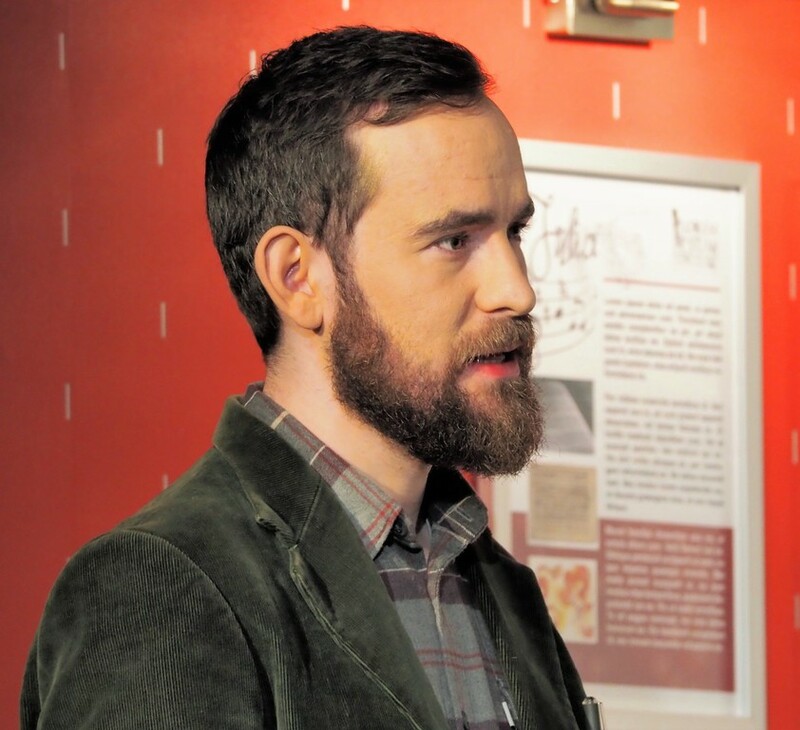 How did they learn such huge scripts – no prompts necessary – amazing! Two of the three were on stage from the beginning, but Robert’s role was also demanding. The characters – all linked to Julia whose death aged 19 in the bedsit where the action took place - were totally believable, the emotions tangible. The successful self-made (Yorkshire) businessman, Julia’s father (Mike) crumpled before our eyes, the educated voice of common-sense (Julia’s boyfriend at the time, Matthew), moved from a rather bored detached person, to one where memories he had worked to put behind him flooded back and overwhelmed him. The ex-janitor of the bed-sit (Robert) diffident, with little education, cash or position was another contrasting character and his role, as a psychic, was superb. Despite not having changes of scenery, costumes, action or many characters, there was intense drama … the tension built up to a crescendo during which the audience and the cast were “blown away” by Julia’s ghost. The cast almost literally - flat on their backs. In the first half there was also some humour so the audience was able to stay the course so to speak – one hardly breathed during the second half! It was totally mesmerising, but I really didn’t know what to make of it at the end. However, I went to sleep thinking about it, awoke thinking about it – powerful drama indeed. 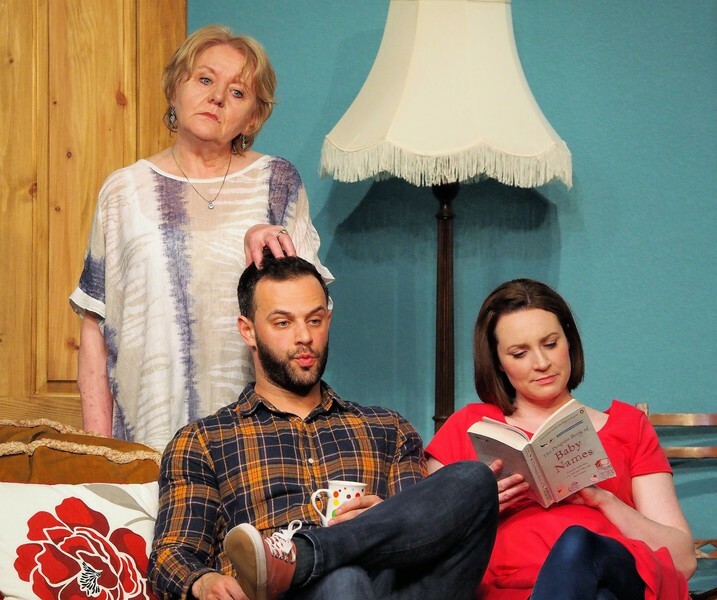 It seemed to suggest that positives like love and talent can be devastating if they overwhelm – communication is key - not a bad message for a playwright. To borrow a comment from one of our party: “It will be one of those plays that you think back to long after the event.” Literally “a haunting performance”! Wow! The acting in 'Haunting Julia' was just outstanding. To have only 3 actors who were on stage most of the time and who were word perfect was very impressive - plus the acting made them totally believable. Well done you and well done Adel Players. We took two new neighbours with us and they said it was far better than they could have imagined. 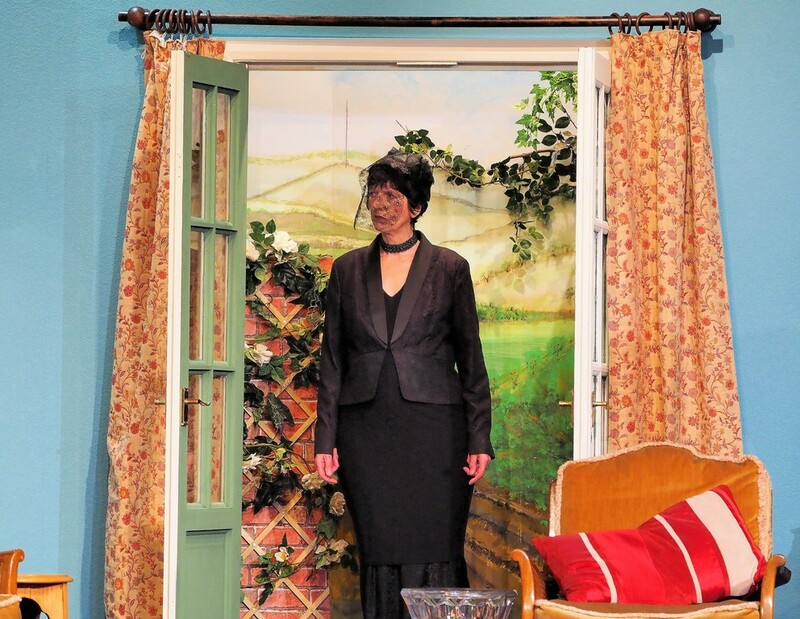 Sometimes I think amateur dramatics is still associated with wobbly scenery and the rest. Our tribute on the 100th anniversary of the armistice (see below for details) was performed on 11 November at the Adel War Memorial Association to an audience of over 120 from the local community. Huge thanks go to Pat Riley for her work in compiling the piece, aided in research by Bernard Riley, Val Crompton and Ann Lightman and of course to all who came, all who took part and the staff and Executive members of the AWMA who helped with preparation. All those who attended agreed it was a very fitting way of marking the anniversary, as well as reminding us of the origins and purpose of the AWMA itself. Gordon Hartley (on the left), grandson of William Hartley who was killed in WW1 and whose story featured in the commemoration. Pictured here with cast members, Harry and Shell Peart. On the 11th day of the 11th month in 1918 the guns finally fell silent after a bloody global conflict that had been billed as the war to end all wars. By then there had been 40 million military and civilian casualties and 6 million British and Irish men had been sent into battle, 82,000 of whom were from Leeds and its surrounding villages. 18 of those who died in the Great War were from Adel. Most communities chose to erect conventional war memorials but the people of this village had a different idea about how they wanted to commemorate the lives of those who weren’t coming home. Find out what happened in France and Leeds from the hour the guns fell silent on 11 November 1918 until 14 November 1928 - the day when determined fund-raising by a small farming community of 400 households enabled Adel Memorial Hall and its many acres of sports fields to be opened as a charitable trust and a vibrant living memorial to the brave young men that Adel had lost. Coming Home to Blighty, an hour of stories, popular songs and poetry from the time when Leeds laughed, sang, cried, and fought its way back to peace, and its soldiers came home to a changed world. "[Remembrance Day] emotion was further aroused by the Adel Players’ performance to a packed house in Adel Memorial Hall of ‘Coming Home to Blighty 1918-1928’ – a moving experience for the players and a tour de force for the audience. For one hour, through memories, poetry and songs, the local story unfolded from the ‘time when Leeds laughed, sang, cried and fought its way back into peace, and its soldiers came home to a changed world’. Eighteen of the Adel men sent into battle never returned, and the local community at that time chose not to erect a conventional memorial, but to commemorate their lives in a different way. In consequence, this small farming community of 400 households, through determined fund-raising, enabled Adel Memorial Hall and its many acres of sports fields to be opened as a charitable trust and a vibrant living memorial to the brave young men that Adel had lost. It would be wrong of me to pick out particular contributions as every one of the Adel Players put their hearts and souls into their performances, but the beautiful rendition of the folksong ‘The Green Fields of France’, the words and music composed by Eric Bogle after his visit in 1976 to the battlefields of northern France and Belgium, at the conclusion of the presentations, followed by a recording of theBenedictus from Karl Jenkins’ oratorio ‘The armed man – a mass for peace’ sung by the soloist Haley Westenra left us all spellbound. 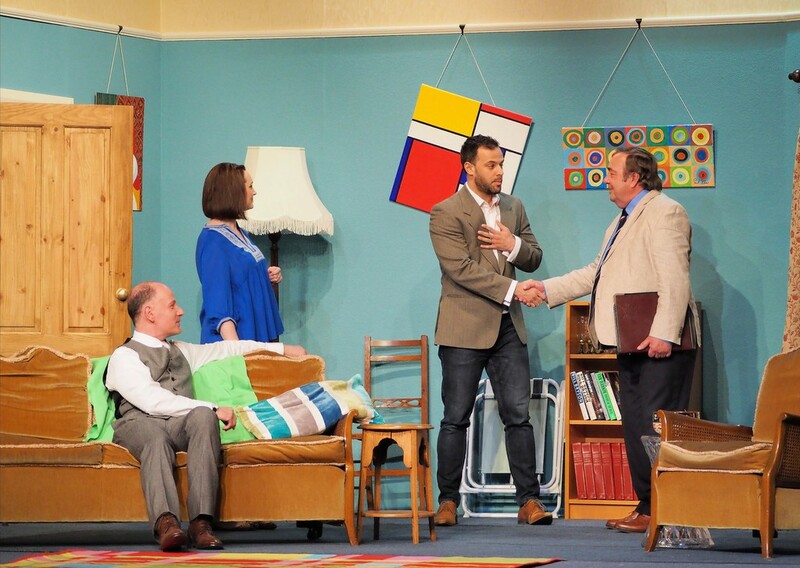 Even a prolonged round of applause could barely do full justice to the thought and effort by both the cast and production team to research, write and deliver such a heartfelt programme. The significant sum of money raised for the British Legion and AWMA charities at the performance is duly acknowledged, as was the time for reflection. Remembrance Day 2018 was indeed a day to remember!" "I just wanted to say what a fantastic and informative performance the Adel Players did tonight. I thought they were brilliant". [Thank you to] Adel Players for producing such a memorable show to mark the centenary of the end of World War 1. In Adel we feel so lucky to have Adel Players and everyone I spoke to marvelled at the performances on Sunday. Also, some people did not know the history of the club, the Memorial Hall and the significance of the large boulder outside the hall. So, thank you for including all of that in your 'Peace and Remembrance in Adel' evening. It was a treat and the hall was packed. The displays, the propelers, the naming of The Blighty Bar and the singalongs were all greatly appreciated. It was truly a great end to a memorable day and Adel Players marked the occasion with, we thought, the right balance of solemnity and humour. Bravo! This type of event really helps to bring our community together. Special mention must go to Pat who ended the evening so appropriately and the song she sang was word-perfect. We were in awe. What a way to end such a moving evening. 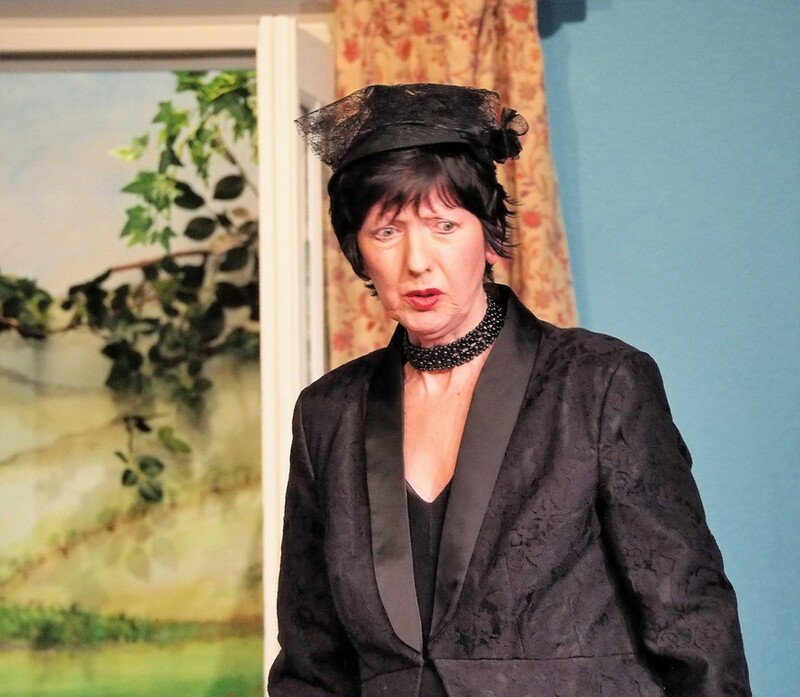 Murder Mystery plays to packed audiences! A huge thank you to all those who came along to our latest Murder Mystery, performed at Bramhope and AWMA on the 8th and 9th June, and to all those involved in the production for making it such a success. Particular thanks must go to Pat Riley for writing this year's script and to Mike Andrews for his sterling efforts as both director and compere. Between the two performances, just short of £2,500 was raised to support AWMA and our ambitious plans to improve our auditorium and other facilities. Thanks for your support, and we look forward to seeing you next year! The latest in our very popular series of murder mysteries, and penned by our very own “writer-in-residence”, Pat Riley, this original piece proved both intriguing and entertaining for our two capacity audiences. 14 years ago Lizzie, the eldest daughter of Colonel Charles Crowe and his wife Julia, disappeared from the family home at Adel Manor, leaving her parents to care for her baby son Jack. Nothing has been heard from her since but the Colonel clings to the belief that she will one day return and he insists every year that they must celebrate her birthday. This obsession with Lizzie is bitterly resented by the rest of the family, especially Lizzie’s son Jack, who is deeply hurt by his mother’s desertion of him when he was just a few months old. Tensions within the family come to a head when a handbag and suitcase belonging to Lizzie are found at Adel Dam Nature Reserve, and the case changes from that of a missing person to a possible case of murder. Lizzie was beautiful and talented: were her family and friends as close to her as they say, or was she surrounded by envy and hatred? After 14 years the truth will out. Detective Inspector Samuel Hainsworth and community WPC Jemina Relampago are investigating! I attended the Bramhope first night and had a great evening. Both the Bramhope and Adel events were sold out. After paying for the reserved ticket and buying raffle tickets, I found a seat at a table with two people I already knew and we were joined by another three. Our table worked in two groups to complete the two paper quizzes we found on the table. One was a picture quiz of TV detectives - I hadn’t realised there were so many! As one on the table never watched crime fiction and another two had spent most of their lives in the USA, the onus was on the three eldest, me included! It was hilarious – if we recognised the face, we might just get the actors name or the series – getting the first and second name of the detective (a point for each) certainly was a challenge! Credit to our oldest team member who came up with the surname Stanhope for Vera. non-TV person beavered away at the crime question sheet, e.g. which debtors’ prison did Charles Dickens father spend time in? (Marshalsea). A girl murdered in 1867 gave rise to what common phrase? (Sweet Fanny Adams). If we didn’t get the answers, we were interested in finding them out! 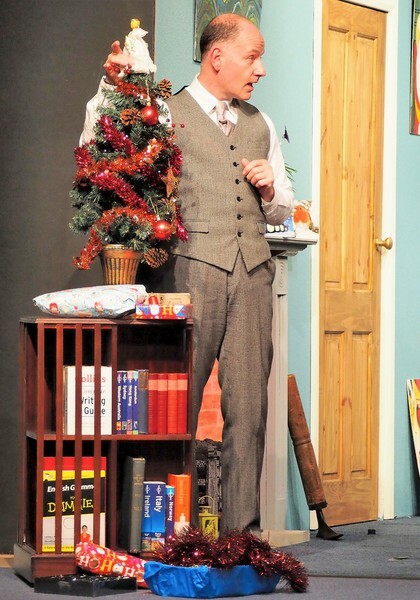 Then – lights- action – and the compere Mike Andrews appeared on stage, dressed in black with a bow tie … as befitting a crow! The play, written by Pat Riley, our local playwright and author, started and we were soon introduced to the Crowe family of Adel Manor! 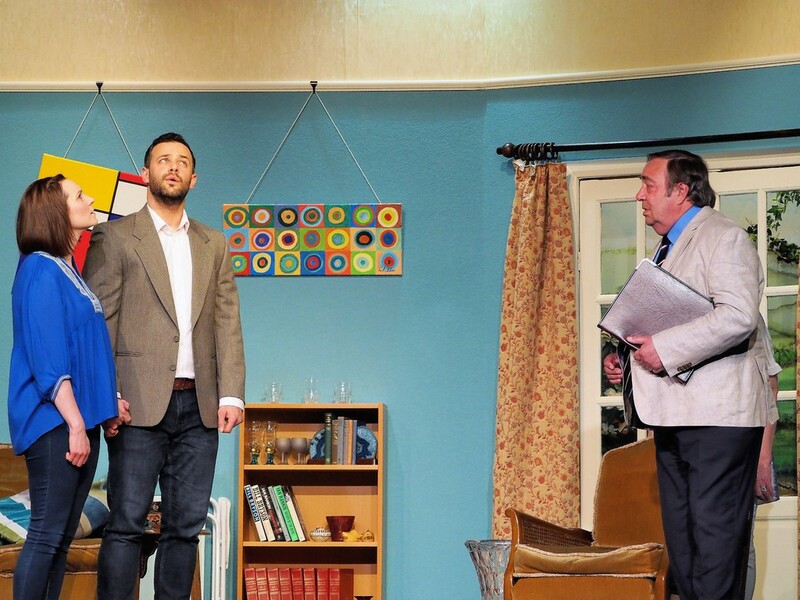 The audience really appreciated the local setting – with the X84 bus service! We learned that a daughter of the family disappeared leaving her baby son behind …but then items turn up in the vicinity of Breary Dam following some restoration work (very topical! ), the Police come, investigate further, discover human remains and a murder investigation is launched. End of Act One – and everyone could possibly be a suspect except Jack who was then a baby and probably his aunt who would have been just 14. It still left four suspects most of whom had motives. As befits a good murder mystery, it isn’t that straight forward! Over a delicious pie and peas (or a vegetarian option) supper, the pros and cons of various suspects were debated – and the killer mentioned as a possibility. The majority decision was (of course) wrong, but not embarrassingly so as we had been pretty sure the true killer conspired in a cover-up. The results of the paper quizzes were also read out. Are mobile phones replacing fading memories we wondered? Our table didn’t win though we were surprised and proud of what we did achieve by putting our heads together. The raffle was then drawn - the money raised was going towards paying for the new roof on the venue that night the Bramhope Village Hall. We then sat back and watched the Finale, in which the true killer was revealed, together with the clues which led to us being able (or not) to detect the person. There was a wonderful twist in the ending, which the audience loved! After the murderer confessed, the police officer managed to get a word in and say that the bones were pre-historic! But she was still arrested as by now she had killed her husband too! It was a great evening. The cast were terrific – and special mention must be made of the youngest, Harry Peart, who had one of the major roles, leading the opening scene! He lived up to the high standards always reached by Adel Players. Anne Mark too had a huge role, especially in the final scene… but they were not alone and it was good to see a number of players we have grown familiar with on stage plus some less familiar. It’s not the first time I’ve commented on how lucky we are in Adel (and now Bramhope) to have such a large, talented and enthusiastic company covering such a range of ages. Our credulity is never stretched by the casting and we are never allowed to get bored. Brilliant! Watch highlights of our April 2014 production - click here for more clips and further information. 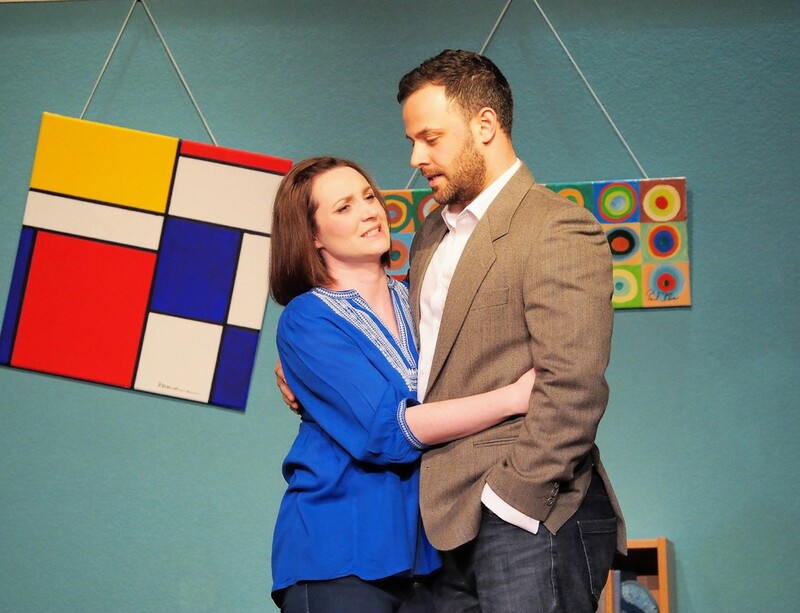 FOUR Festival of Theatre awards for 'If I Were You'! Read all about it in News and Notices!